FIIs In Indian Stock Markets: An Opportunity Or Threat? | Business Article | MBA Skool-Study.Learn.Share. FIIs In Indian Stock Markets: An Opportunity Or Threat? In mid October 2010 came the IPO of state owned enterprise - Coal India ltd., which got over-subscribed by 15 times, raising the capital to the tune of Rs 150 billion, through aggressive applications from both institutional and non institutional investors. The startling reality that came to fore was that out of the 770 applicants in the institutional segment, over 600 belonged to the Foreign Institutional Investors (FIIs), which would mean that after allotment of shares, FIIs would be sitting on back of a whooping cash balance of $ 26 billion. It was this sheer volume of FIIs stake which not only gave sleepless nights to brokers across the nation, but also stamped the authority of the foreign investors in contemporary security markets. This is the tale of the Indian Stock Markets, which see-saw between quantifiable fundamentals and volatile sentiments, and tread on a tight rope stretched between the very opportunistic FIIs at one end and the ever cautious yet so vulnerable domestic investors on the other. The great Indian growth story has always been an eye-candy for the foreign investors. The 1991 Liberalisation was the first step, and subsequent relaxation of cap on foreign investments in 2005 set the floodgates open eventually. In no time, the FIIs transformed into a major player accounting for over 21 percent share of the markets. Many experts consider FIIs to be "Fair Weather Friends", who come in bulk when there is money to be made and leave abruptly at the first sign of impending trouble in the host country, thereby inducing undesirable risk and uncertainty into markets. A good recent example is evident from FII behaviour in last eighteen months itself. Better fundamentals of Indian economy as compared to the western economies, attracted and prompted FIIs to invest aggressively here, raising the total to a astronomical figure of $ 20 billion. This almost single handily took the Sensex to touch the 20,000 mark again. However, come November 2010, few local factors like inflation, lower IIP and internal political drama, resulted in major square off of FII positions in no time, thereby pushing the market into a sluggish and corrective mode. There are other disturbing instances when the FIIs became the agents triggering a blood bath at Dalal Street. On 16th Oct, 2007 Finance Minister Mr. P. Chidambaram made a statement expressing his apprehensions over the usage offshore derivative instrument: P-notes, through which the FIIs made about 60% of their investment in India. Little did the market analysts or the Finance Minister knew that this seemingly ordinary statement would have the potential to inflict a deadly free fall of the market indices. The markets crashed by a staggering 9% within few hours, registering one of the biggest absolute fall in Indian stock market history. The consequences were so severe that the markets had to be closed down for an hour and Mr. Chidambaram had to call a press conference to rephrase his statements. It was yet another alarming call to the domestic investors that woke them up to the rising dominance and influence of the FIIs on Indian Stock Markets. There is another set of experts who believe that FIIs are life blood for an emerging economy like India. They augment domestic saving without increasing foreign debt, provide vital liquidity to Indian companies to sustain road to growth, reduce cost of equity capital and help reduce deficit of Balance of payments (BOP). Also these experts believe that FIIs, like any other investors buy or sell according to prevailing sentiments in the market, rather than creating any sentiments that drive the markets. Hence there lies a conflict between the pros and cons of FIIs and the all important question regarding the role of FIIs in deciding the fate of our stock markets. From the above charts it is clear that net FII investments at BSE show a similar pattern to the BSE 500 index monthly average closings. The correlation coefficient between net FII inflow to BSE and change in BSE 500 index is 0.63, which shows a positive relation of moderate strength. However, a positive correlation, in itself, does not imply causality. As both directions of causality are equally possible, auto regressions are run to test Granger test of causality between the two estimated variables. Ho: Monthly BSE 500 index change does not Granger causes monthly net FIIs flows to the Stock Market. [In this autoregressive analysis, net FII flows are the dependent variable with its own lagged terms and lagged values of BSE 500 Index returns as the two independent variables in unrestricted equation]. 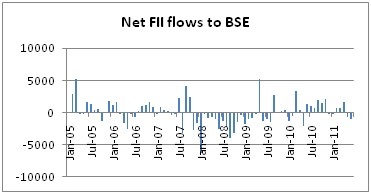 Ho: Monthly Net FIIs flow does not Granger Cause monthly returns of BSE 500 index. [Here, BSE 500 Index return is the dependent variable with its own lagged terms and lagged values of net FII flow as the two independent variables in unrestricted equation]. Test II hypothesis that FIIs do not drive BSE 500 index is rejected both at 5% and 1% level of significance. Test I hypothesis, on other hand, is rejected only at 5% significance. However, comparison of the test results suggests that there is a stronger support for causality running from FII net flows to index returns and a milder evidence of reverse causality. Thus the study indicate that FII flows are more of a cause than an effect of stock market returns and fluctuations for the given time period. 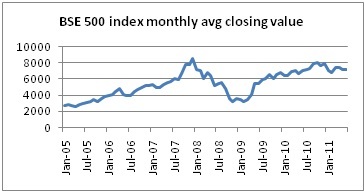 The empirical study conducted for the time frame from Jan 2005 to Jun 2011, supports the “FII inducing volatility and driving the market indices” theory to a substantial level. Compared to security markets in developed economies, Indian markets being narrower and shallower, allows foreign investors with access to significant funds, to become the dominant player in determining the course of markets. Because of their over sensitive investment behaviour and herding nature, FIIs are capable of causing severe capital out flight abruptly, tumbling share prices in no time and making stock markets unstable and unpredictable. In the process, more often than not, the domestic individual investors are on the receiving end, losing their precious savings in such outrageous speculative trading. India as an emerging economic power cannot afford to be intimidated down by the FIIs every now and then. We need formidable Domestic Investors which can pump in liquidity even during cash crunch circumstances thereby fuelling the development. With savings to the tune of roughly 35% of GDP, India can use this to its strength by formulating policies which ensure that domestic funds like Pension Funds, Provident Funds & other Large Corpus Funds have a greater exposure to the equity market. The foreign investment in India should be encouraged, but only from a strategic long term perspective. Derivative instruments which facilitate long term foreign investment with specified lock in periods should be introduced. Sustained long term foreign investments would not only contribute to India's growth but also help in curbing volatility, maintaining currency stability and creating environment for inclusive economic development. This article has been authored by Akash Jauhari and Karan Verma from IMT-Ghaziabad.